Canada Post says it has issued a 72-hour lockout notice to the Canadian Union of Postal Workers, raising the spectre of a work stoppage by Friday. The Crown corporation blamed prolonged negotiations, the Canadian Union of Postal Workers' strike mandate and the financial cost of a rapid decline in mail volume. "Nearly all of our largest e-commerce customers have already moved most or all of their parcel volumes to other carriers, resulting in a volume decline of at least 75 per cent from these customers," the carrier said in a statement Tuesday. Rather, Canada Post says, the lockout notice allows the carrier to "take measures that are necessary to respond to the changing business reality." Both sides say they are hopeful a deal can be reached before then. In its response, CUPW said the corporation is using the lockout notice to drive 50,000 workers "out onto the streets without pay in an effort to impose steep concessions on them." "They refused to negotiate fairly with us and now they're locking the doors and will try to starve us into submission," said CUPW president Mike Palecek. "Canada Post has been out in the media for weeks saying there's going to be an interruption and now they're complaining there's no mail or parcels in the system," he told the CBC's Metro Morning radio show. A key sticking point in negotiations involves changes to employee pension plans. Essentially, the mail service wants to switch new hires to a defined contribution plan, where payouts are not guaranteed. That's different from the defined benefit plan that current members get, which guarantees a fixed benefit regardless of investment returns, similar to CPP. Canada Post's pension plan posted an annual surplus of $1.2 billion last year, but has a solvency deficit of almost $6 billion, the fund's annual report shows. The Crown corporation said Monday that CUPW's demands are "not affordable" and would add $1 billion in costs over the life of a new contract. The union disputes that figure and says adding new members paying into the pension and services for customers will more than pay for themselves. The union accuses the corporation of creating uncertainty by warning the public to avoid the post office. "We believe they are creating a crisis," Palecek said. "The position of the pension plan is improving." The union also says it wants to close the gap between what its urban carriers are paid, and its rural ones. Mail carriers in rural and suburban regions are typically female, and make as much as 28 per cent less for doing the same job, the union says. But Ottawa has deemed Old Age Security, Canada Pension Plan, Working Income Tax Benefit and the Canada Child Benefit cheques "essential" — even during a labour disruption. 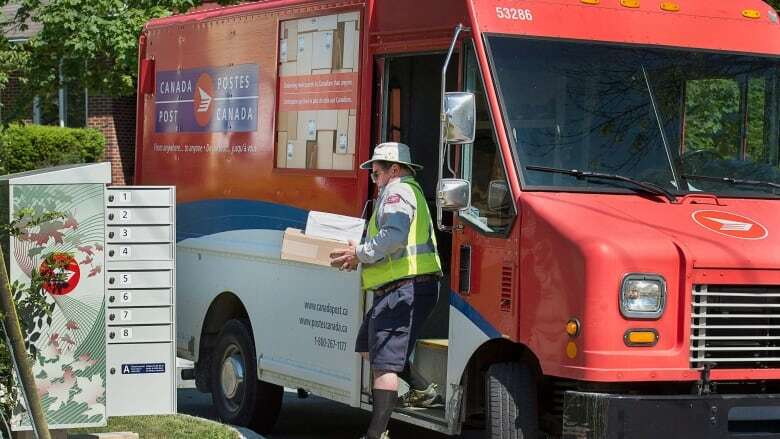 Spokesman Jon Hamilton said Canada Post has a memorandum of agreement with the union "where the federal socio-economic cheques will be delivered." "In the event of a work disruption we would arrange ... delivery one day of the month," he said Monday. The last time there was a work stoppage at Canada Post was in 2011, an impasse that ended when Ottawa legislated an end to the dispute with controversial back-to-work legislation. The current Liberal government said Tuesday it has no plans to intervene at this time. "I encourage both parties to continue their discussions, and I remain hopeful that an agreement can be reached by the parties," Employment Minister Mary Ann Mihychuk said in a statement. "Federal mediators are assisting the parties in their negotiations," and added that Ottawa "has contingency plans in place" should any mail service interruption happen.